Image from PEI Visitors Guide (2005), p. 18. Once in a while, historians come up with an idea, do some research, analyze it, write that up, and find we have something resembling a book. Or maybe it turns out to be an article. Or a blog post. In those cases, we attach our name to it and send it out into the world. But what about those stray and idiosyncratic findings that don’t even rise to the status of a blog post, and deserve a longer life than a tweet? So here’s my idea: The Acknowledgments Project. You post stuff you’ve found that you know you can’t use as well as someone else probably can. If someone can use it, great. If when they write it up they acknowledge your little contribution, great. Whatevs. An example: This summer, I read through 50 years of Prince Edward Island’s annual Visitors Guides for an article I was writing on images of landscape in tourism promotion. 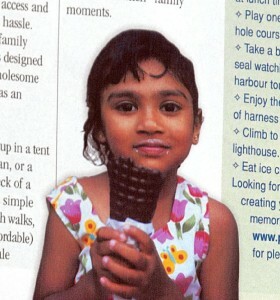 I realized something funny about the tens of thousands of photos I was looking at, doublechecked, and sure enough: the first visible minority person to appear in a photo promoting PEI, with the exception of a very occasional Mi’kmaq, was apparently this girl with South Asian features in 2005. This seems extraordinarily late, if only because it was an entire generation after PEI had begun actively promoting itself to Japanese tourists. (The first visible minority to appear anywhere in the guides was a wax Michael Jordan, in an ad for the “Wax World of the Stars” tourist attraction in 2004). I’m unlikely to do anything more with this. I know my strengths and weaknesses as a historian, as a writer, and it doesn’t really fit into what I do. If you can use it or run with it, please do. That’s it, The Acknowledgments Project. But I’m unlikely to ever get this up and running. If you feel like doing anything more with it, be my guest. Alan MacEachern is an associate professor of history at the University of Western Ontario. He is also director of the Network in Canadian History and Environment (NiCHE). That, Dr. MacEachern, is a fully brilliant idea.